So both the new S9 express bus on 16th Street and the Circulator on 14th Street have started running. Has anyone taken them? Are they faster? I saw a bunch of Circulators on 14th this morning -- more than the regular Metrobuses in fact. The Circulator is only $1 and you can use SmarTrip, while I'm not sure if the 16th Street Express is the regular $1.25 or the $3 for an express bus. I would assume $3, but it doesn't have the line on Metro's fare page. The city's Summer Youth Employment Program is starting up again, and while it's had some problems, it can still give young people some work experience and give them something constructive to do in the lazy summer months. Here's more info on the program, which places kids in various jobs, from art to environment to construction to education. The kids who painted the mural on Kenyon Street were Summer Youth Employment kids, for example, and all participants get paid the Federal minimum wage. And for those kids too young for the jobs program, the city has a Summer Fun program too. The ANSWER posters are gone?! 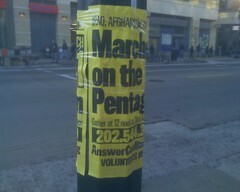 This is kind of shocking - the posters for the ANSWER Coalition's March on the Pentagon, which were all over the neighborhood a few weeks ago, are gone. Their event happened last weekend, and considering they usually keep their posters up indefinitely after their events, I'm pretty stunned. Either ANSWER got the message that people are tired of seeing their crap everywhere, or neighbors just took everything down. Either way, I'm in favor. I did see a few little yellow ANSWER stickers, but most had been peeled off. The folks over at DCmud have an interview with John Andrade, owner of the upcoming Meridian Pint at 11th and Park (and Asylum in Adams Morgan). The Pint will be a Belgian beer focused restaurant and bar -- sounds good to me. Andrade says they plan to be open by Fall. 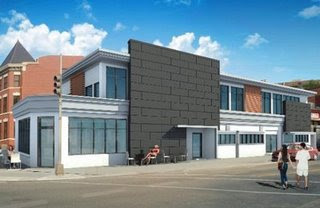 The picture looks interesting too - the second floor will house offices for development/architecture company 3dg, which is building Meridian Pint, and for a travel agency. Personally I'm looking forward to this spot a lot - Wonderland and Commonwealth are frequently crowded and other Belgian joints are a bit far away, other than the Saloon on U Street. Surprisingly, I've heard less complaints about this place than about the wine bar at 11th and Lamont. More good news on the bus front - a new 16th Street express bus is starting March 30. The bus, to be called the S9, makes 16 stops between the Silver Spring Metro and 16th and F, including a few in our neck of the woods - Spring Road, Park Rd, Irving/Columbia Rd, and Euclid Street. That's kind of a lot of stops for an express bus, but hey, it's got to be faster than the stop-every-block thing the bus does now. Click the map for a bigger version. Want to volunteer in the neighborhood? Feel like doing something good in the hood? Greater DC Cares, an organization which places volunteers with local non-profits, is is looking to get more volunteers in the Columbia Heights area. Here's their website, click on Volunteers or read more about them. Interested folks can also check out their new blog, which has contact info. Know of any other volunteer opportunities in the hood? Capitol Letters is a good one, for example. --Residential street sweeping resumes today. Make sure you check the signs if you park your cars on the street or you could get ticketed or towed. --Apparently some neighbors are fed up with block-partying/drug dealing/shenanigans on Rock Creek Church Road. Anybody know more about this? I don't live up there. It's my favorite sports time again, March Madness, and there are games on all day today and this weekend. I was trying to think of places to go to watch the games in the hood -- there aren't many, but there are a few. CommonWealth has TVs, but the bar area can be crowded at happy hour time, so you might want to get there early. I'm guessing Ruby Tuesday does as well, though to be honest I've never been in there. In addition, The Heights has some TVs over the bar. So you can watch your local teams in the hood, like Maryland (unfortunately VCU and American lost close ones), or your away teams. Wonderland and the Red Derby don't have TVs, so don't try there. 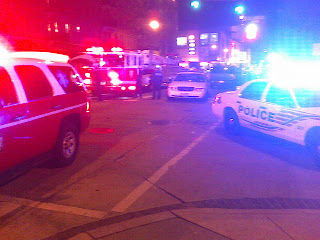 U Street and Mt. Pleasant would also have some opportunities, plus lots in Adams Morgan. 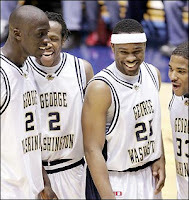 GW picture taken from Sports Illustrated. Not from this year, obviously. Want to garden, but don't have a backyard? If you have a green thumb but no place to use it, take note - there's a new website called Sharing Backyards DC, where folks can sign up to share their yard to gardeners, or can sign up to look for a yard to use. The Post has an article on it, it sounds pretty cool. It appears to be free, and there are a lot of folks in our neighborhood both looking for a yard and hoping to share theirs. The site has a Google map with icons on it for looking and willing to share, plus little blurbs when you click the icon. Anyone interested in doing either! Take a look at the site. Word on the street is that Rita's Water Ice is open now. Bring on the warm weather. I'm a big fan of the lemon gelati, you? Rita's is at 3237 14th St NW, next to Julia's Empanadas and Pollo Campero. 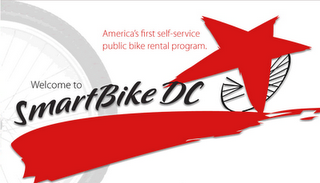 Saw this on WTOP via DCist, the Smartbike DC bike sharing program will expand into Columbia Heights this summer. I wrote about Smartbike coming to the neighborhood before, but the timing was unclear. Glad to see! I'm guessing it'll go at DCUSA or nearby. A better 14th Street bus! Looks like people taking the 14th Street bus might have a quicker option, thankfully. The 14th Street buses (52, 53, 53) now stop on literally every block, which I've complained about before - it can take 45 minutes to go 2 miles. Councilman Jim Graham and others have been pusing for a new Circulator bus line to go from Woodley Park to Columbia Heights, then down 14th to K Street, with only 7 stops in each direction - 14th and Irving/Columbia for us CHers (see map). That means it's an express bus, and hopefully would be very quick. 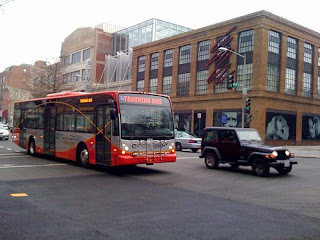 DCist has more, including the photo below of a bus doing training on 14th Street, as does Greater Greater Washington, and they expect the line to start up towards the end of this month or early April. Great news! And DCist notes they'll be launching a new Circulator website around the same time the line starts, with updated scheduling information. Here's the current site. Sorry for the lack of posts lately, travel and busy times in blog-land. Here's a few things happening in the neighborhood lately. --Watch out for a package thief on the 700 block of Harvard Street NW (and probably elsewhere). --The Mayor's Office of Community Relations did a Fix-It in the neighborhood yesterday, where they walk around and fix or note various problems - graffiti, trash, alleys that need to be cleaned, broken sidewalks, etc. They went to the 700 block of Columbia Rd NW, 1000 Block of Irving St NW, 3100 block of Sherman Ave NW, 600 Block of Gresham St NW, the 1800 Block of Columbia Rd NW and a few other spots outside the neighborhood. Good to see them getting around the hood, and here are photos from the last Fix-Its. As always, you can report these kind of issues and request bulk trash pickup, new garbage cans, etc at the city's online Service Request Center, src.dc.gov. --There's an opening reception today at the Nevin Kelly Gallery in the Highland Park building at 14th and Irving for artist Wesley Wheeler. It's from 6-9 pm and the gallery is at 1400 Irving St NW, suite 132. The Post wrote about Capitol Letters' Mustache-a-Thon fundraiser, and it's a pretty cool article. I wrote about it awhile ago, basically folks grow mustaches and get donations to do so, with the money going to Capitol Letters, a Columbia Heights nonprofit that tutors local kids. They also accept donations, and women and non-hirsute men can help too. Here's more on their fundraiser. We win? Looks like WMATA has finally had a good idea and will release their scheduling data by March 23, according to DCist. Greater Greater Washington has the full story - it looks like anyone will be able to download it, and it's the same data that powers Metro's online Trip Planner software. Hopefully Google Transit will use it, and I bet other folks will build their own applications! The people have spoken?! I'm hearing about a huge line around the block at 14th and Harvard right now, apparently for public housing assignments. I'm not up there right now, anyone see it or snap any pictures? Pho 14 opening in 7-10 days? Per ReadySetDC, apparently Pho 14, the pho joint on Park Road between 14h and 15th, will be opening in 7-10 days if their final inspection goes well. They have more, plus photos. Drinking beer in the neighborhood? 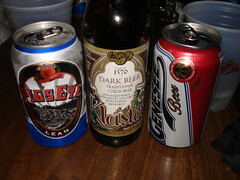 I just heard about a new feature from the City Paper's Beerspotter column - a Twitter account you can message if you see a good deal or unusual beer, and they'll post it. Pretty neat deal - maybe see something cool at D'vines, CommonWealth, or Red Derby? Let folks know. Here's more on the Beerspotter Twitter account - basically, just follow beerspotter on Twitter and send them a direct message with "info on the name of the beer, price, location, and maybe something pithy," and it will automatically post. 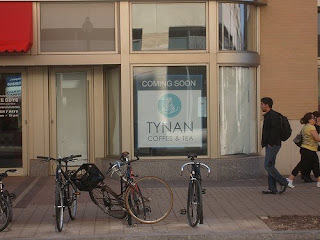 Looks like another coffee joint is coming to the neighborhood: Tynan Coffee & Tea, to be located in the Highland Park building, next to Five Guys and right by the Metro. It doesn't appear to be a chain and I can't find anything about it on the web. I guess Columbia Heightsters like their caffeine: by my count, this is the 7th coffee shop in the neighborhood - the two Starbucks, Columbia Heights Coffee (my favorite), Dunkin Donuts, Sticky Fingers, and Coco Libre, plus Mayorga, which closed, and more if you count Georgia Ave. Am I forgetting any? Hat-tip to ReadySetDC, a cool new arts, development, and culture blog, for finding it and for letting me use their photo. UPDATE: a commenter here spoke to the owners, and they said it'll be a few months before they open. The other day I got a link to a site called BlockShopper, which shows information about people buying houses in various neighborhoods around the country. They use public information, like name of buyer, the cost, and the address, but then they Google the folks and put more information, like where the person works, their photo, their resume, etc. It's pretty strange and weird. I guess the idea is for home buyers and owners to see what sort of people are buying, as their FAQ says "For home buyers, we built BlockShopper to be the ultimate objective resource, meant to give you the intelligence edge. Before you make the biggest purchase of your life, you cannot afford not do due diligence here." Seems to me that there could be a possibility for something negative to happen. The site's FAQ says they won't take information down if requested, and they've been sued by a law firm, though the suit seems kind of specious - they sued the site for trademark infringement, and BlockShopper settled. I guess the site is legal, but it's pretty creepy. General Manager John Catoe: There has been a lot of talk lately about Next Bus, which is a good thing because we expect Next Bus to be back up and running this July. The return of NextBus is highly anticipated by many bus riders, and by many who were able to gain access to an internal test site over the last few months. We have restricted access to that test site, which has disappointed a number of people. Those people who were using the system have reported in blogs that the system was working well for them, and I’m pleased to hear that. However, I have to take a much wider view of NextBus and the accuracy of its predictions. Launching a “beta” version may make sense for software developers, it doesn’t make sense for Metro. Before NextBus is fielded again, I have to be sure that it will work well for all of our bus riders. If we allow access to a test site, then we are in effect launching that site and service. That means we need to be ready to give anyone and everyone using that site our full attention if they have problems and complaints. All the disclaimers in the world won’t make any practical difference. If we were to allow access to the site, then, potentially, there would be hundreds of thousands trying to use something that just isn’t ready for prime time, yet. That means a flood of complaints, and we take every complaint seriously. If we allow the system to be used before we’re confident that its ready, then, although, it may be convenient for some, it just won’t work for everyone the way we envision it should. I would also take more resources, both financially and in terms of manpower that we aren't ready to commit yet. When the system went off-line on October 31, 2007, we estimated that it would take up to 18 months to bring it back. That estimate was fairly accurate. Just be patient a few more months, and the service will be back up. There’s a saying “measure twice and cut once.” That’s what we are doing with NextBus to make sure we have everything in place to meet our goal of 95% accuracy on bus arrival times. This will be a significant improvement, and worth the wait. This is good and bad. It's good that Catoe clearly sees that people want this soon, but July is still 4.5 months away. It seems Catoe and the Metro staff don't understand the point of a beta test, which is to find errors BEFORE you release your final product. They obviously didn't do that well enough the first time, which is why they had to take it down before. UPDATE: Sommer gives the rundown over at DCist. The charity Food and Friends, which makes and delivers meals to people with AIDS, cancer and other illnesses, is having a cool event, Dining Out For Life, tonight. Here's how it works: participating restaurants donate 25% (or sometimes all) of the money they make tonight to Food and Friends, and CommonWealth and The Heights in our neighborhood are taking part. Dos Gringos, Tonic and Radius are doing it in Mount Pleasant too, plus lots of other restaurants around the area. So do something good for your stomach and for people around the region - go have some food or drinks at CommonWealth or The Heights tonight! Thanks to a reader for passing this on, Metro general manager John Catoe is having an online chat Friday at noon, send him some questions ahead of time about NextBus! --I use the bus sometimes, but with such a system back in place i'd use it so much more often! --I like taking the bus, but knowing how long I have to wait would help me be a more-efficient traveler so I could know whether I should walk, take the bus, or take the Metro. Thanks. --Long overdue and sorely needed! Help make DC's transit systems among the best in the nation! I heard about this yesterday, but I didn't realize it was in the neighborhood - a driver of the 52 bus stopped and punched McGruff the crime dog, then drove off and was subsequently arrested. He said he did it as a joke. Pretty crazy! Here's a Post article on it and one from Fox DC. 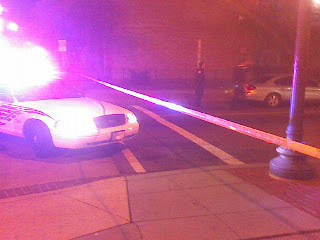 There's been a few incidents lately that made the news, namely a shooting on the 1300 block of Columbia Road on the 25th and a stabbing on the 25th in a carry-out on Georgia Ave NW. A reader sent in these photos of the Columbia Road incident. Luckily these aren't too common, but I appreciate the photos. The reader said he saw the police apprehending a man in about his 30s behind the complex on Columbia. Here are some good ones. Have you signed yet? --Yes, I'm that woman sprinting for the bus as it peels away from my Mass Ave. stop--three minutes early. And yes, it would make a huge positive difference in my life to know how long I have until the next bus arrives. At least I could keep my gym shoes in my bag until after work. --This is such a great service and would increase ridership! --I am tired of waiting upwards of 20-30 minutes for a bus only to see them bunched together. Let's get some accountability for WMATA and some convenience for customers. --Nextbus was not 100% accurate when we had it but then what is? I am willing to accept something that is not perfect instead of waiting another year for perfection. Last night I went to Nori, and it was very good. I got the jop chae, which is Korean stir-fried clear noodles with vegetables and beef (you can also get chicken or veggies). It was great, well cooked noodles and good, fresh ingredients. The miso soup hit the spot and a meal for two came out to about $30. On a previous visit I got Bangkok peanut noodles with chicken, which was sweet with a nice building spiciness, and the clams appetizer (or maybe mussels, I forget) was tasty too. I recommend it if you haven't been - it may not be the best Asian place in the city, and the sushi is average, but the entrees are good and it's close and pretty cheap. Nori is in the Tivoli building at 14th and Park. As promised, I started a petition asking for NextBus - you can sign it on the right side of the blog, and here's the link if you want to promote it yourself (please do). I plan to put it on Facebook and tell other sites about it also.